From Marcus Nunes we get this figure which helps shed some light on the recent upswing in the stock market. 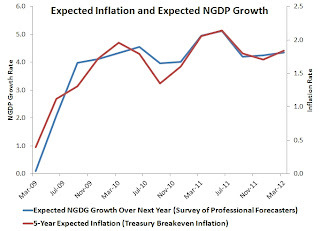 It shows that as inflationary expectations improve so does the stock market. 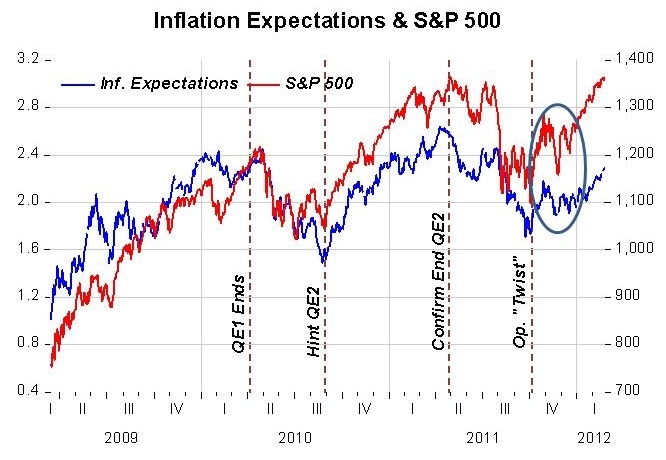 Note that Marcus Nunes shows in the figure how the Fed's various monetary easing programs have been tied to trend changes in inflation expectations and the stock market. Thus, the most recent developments might also be attributed to the Fed's new long-run interest rate forecasts which is not on the figure. For me the big take away from this picture is that all this time the Fed has been playing with us. If the Fed's timid, piecemeal programs listed on the figure above can systematically affect the stock market, then just imagine what would happen if the Fed had gone nuclear and adopted a nominal GDP level target. The stock market would be way up, balance sheets would be stronger, the economic outlook would be vastly improved, and the economy would be back on path to full employment. This indicates that my interpretation of the expected inflation series as an implicit forecast of expected future aggregate demand is appropriate, at least for now. Also higher expected inflation is a reason to get out of bonds and into real assets: stock market, housing, etc. I'd think this relation only holds near the zero lower bound. Ralph, yes but then that is exactly the type of portfolio adjustments needed to jump start the economy. Foosion, agreed and David Glasner has more on that point. I do wish, though, that we could get a NGDP futures market and directly observe the market's forecast of future aggregate aggregate demand. If inflation expectations are likely to result in more real growth; and if the stock market rises as a result; then why are 5yr TIPS real rates at record lows? One explanation is financial repression: the 5yr nominal yield is dominated by the 2014 ZIRP promise, so real rates must fall as inflation expectations rise. The other explanation violates EMH: markets are segmented, and the bond and stock markets disagree on the real growth outlook (otherwise they would be dumping TIPS and buying risk assets). The split in markets goes beyond TIPS/stocks to safe vs. risk assets in general. Stocks have rallied 100% and are back to historical P/E's; junk bond spreads are normal and investment grade spreads at record lows. Corporate profits are at peak levels and non-structure business investment has seen a robust recovery. Why, then, the excess demand for safe assets? Tough question. 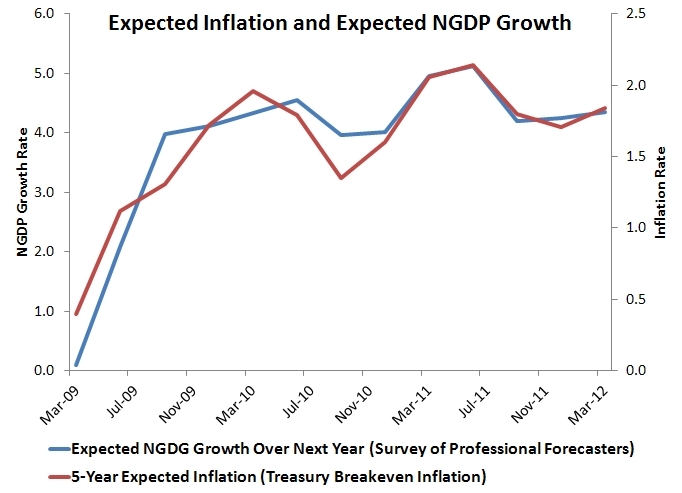 I added a NGDP forecast series to post in an update and it confirms the notion of an improved economic outlook. My guess is that this improvement is only modest and nowhere near robust enough to restore full employment, reduce uncertainty, and meaningfully lower the cyclical demand for safe assets. Regarding the financial repression idea, I think the market understands that the Fed's interest rate forecasts are conditional. Thus, I see the low real rates being a result more of the demand for safe assets and the less-than-robust economic outlook. Very interesting. 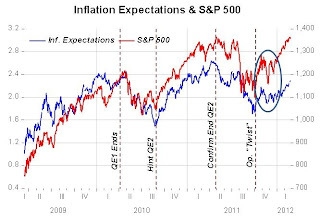 I had no idea about the correlation between stock prices and inflation being something positive. With that said, one would have to agree with Ralph to start downsizing on bonds and getting into real assets. "just imagine what would happen if the Fed had gone nuclear and adopted a nominal GDP level target. The stock market would be way up, balance sheets would be stronger, the economic outlook would be vastly improved, and the economy would be back on path to full employment." And then, it would slowly become apparent that nothing real had changed, except for the debt burden, and the stock market would stall, unemployment would begin to creep back up and the interest rates demanded by the cheated creditors to lend more would rise. The cry would go up for more "stimulus", and the US would take another step on the road to Argentina. We have tried all this before, with disappointing results. Economists younger than about 50 should go back and read about the 1970s. Rebel Economist, I have but the period doesn't fit. The 1930s, on the other hand, does fit. foosion hits a key point. Historically, stocks have been a very poor inflation hedge, except at low inflation levels. Look at the 60's and 70's when inflation was growing and finally peaked in 1980. Stocks went nowhere for about 18 years, then took off when Volker killed the dragon.